It takes a long-term, year-after year strategy to achieve results. There are many complexities: Fair Market Value (FMV) assessments may be required by state law but local jurisdictions are left to execute the best they can. Property tax is one of your biggest risks and you need a comprehensive approach to keep it under control. 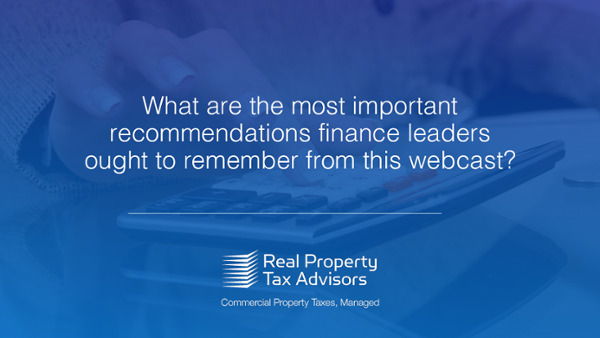 What are the most important recommendations finance leaders ought to remember from this Webcast? The biggest thing that finance leaders ought to remember is the complexity of property taxes. I’ve been doing this for a long time now and there’s really nothing easy or simple about it. A long-term, year-after-year strategy is really the only way that you can minimize the risk and take the reactive moments out of property tax for your company. Property tax exposure is one of your company’s biggest risks. It is your largest state and local tax, and it’s not going away. So, the sooner you understand what property tax assets you have and map the landscape of each jurisdiction, you can develop a platform where you can see everything at a high level on a dashboard and be able to drill down into the specific details. This enables you to answer questions at any time. The bonus to your organization is when you can project your property tax savings by dollars and estimated date of receipt. At that point, you have limited your risk and exposure. Then you have to persevere and go to the next level by appealing assets that are over-valued by the taxing jurisdiction. Stu made a good point. The assessor may not give you the reduction that you want, and you may have to go to the board. Then the board might not give you the reduction that you want. Then it becomes a question of “Do we go to court?” Well, what’s the cost to go to court? Does it make sense? Are there other options? So at the end of the day, it’s complex, it takes some work, it takes a commitment, but it can be done. Thank you Anne. And Stu, what would you want attendees to come away with, particularly based on your own experience? I think it really comes down to people getting too comfortable with their property tax bills. “I see it this year, I’ll see it again next year…” Property taxes don’t get the recognition or the centralized reporting that a federal income tax or even a state income tax group calculates and presents. It’s a big number though and it’s very meaningful to our company and we now know there are opportunities to reduce and manage our risk.